Whether you’re a Fortune 500 Company, a home-based business, or a brand new startup, your company needs an 800 number. Using a toll free number gives your business a nationwide presence and, quite frankly, it looks more professional than using a local number. 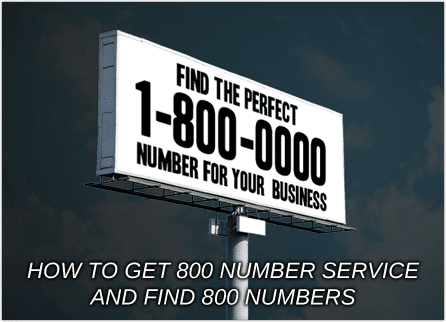 If you are not sure how to get 800 number service or find 800 numbers – we can help! We have a custom toll free search tool that’s connected directly to the FCC’s National Database of available toll free numbers. Our search tool can help you find 800 numbers by word, phrase, or numeric combination, searching through all available toll free prefixes, including 800, 888, 877, 866, 855, 844, and 833. And if the vanity 800 numbers you’re looking for have already been snapped up by some other company, our search tool will provide you with available suggestions that are closely related to your original search. 1. Why is it so hard to find 800 numbers? True 800 numbers first came out in the 1960s and since then most of them have been scooped up by other businesses. However, every time the spear pool of toll free numbers get too low, the FCC releases a new toll free prefix, such as 888, 877 866, 855, 844, and the recently released 833 numbers. The next toll free prefix to be released will be 822, but no release date has been set as of yet. With that said, UniTel Voice has instant access to every available toll free number via the FCC’s national toll free number database. We can help you find a great vanity toll free number or if you prefer we do have a select batch of available true 800 numbers for sale. You can search for these numbers on our signup page. Just go to “Step 2: Choose Your number” and then select the “Custom Toll Free Search Box” to look for numbers. If you can’t find the number your looking for let us know and we’d be happy to help. 2. If an 800 number is disconnected, does that mean it’s available? We get asked this question a lot, and unfortunately, the answer is no. In many cases, you might call a 1-800 number and it rings disconnected but that doesn’t mean it’s “not in use” by another company. It’s often the case that the 800 number is simply forwarding to a DID line that has been disconnected, so technically, the 800 number is in use and unavailable. You can confirm by searching for the number on our site or by contacting our support team here at UniTel Voice. The other side of this coin is that if a toll free number is disconnected there’s virtually no way to get in contact with the owner of the number to make a purchase offer. The closest you could come is to find out the toll free number in question’s RespOrg (responsible organization, i.e., the phone company who provides service to the number). But even if you track down the RespOrg, the phone company won’t give you their customer’s contact info (they can’t because of privacy issues). And, even if you somehow identify who owns the 800 number, trying to track down the decision maker who would be willing to listen to your purchase offer is virtually impossible. At the end of the day, your best use of time and money is just to get a different number or toll free prefix (855-ROOFING is really just as good as 800-ROOFING). 3. If I just want an 800 number for my cell phone can I buy one and transfer it to my cell phone service provider? Your cell phone provider is not a toll free service provider, so in order to get an 800 number for your cell phone, you’ll need to set up toll free number service with a third-party company like UniTel Voice. In fact, UniTel Voice is a virtual phone system that’s designed to work with your existing cell phone. With UniTel Voce you can keep your personal calls separate from your business calls using the same phone. You can forward your 800 number directly to your cell phone or use our free smartphone app.